Bhagini Nivedita Sahakari Bank (Bhagini Nivedita Sahakari Bank Limited), Pune Published Job Notification for 02 Chartered Accountant & Advocate Posts. 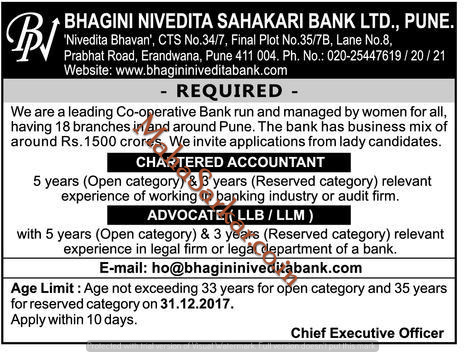 Candidates who wish to apply must look at Bhagini Nivedita Sahakari Bank Chartered Accountant & Advocate Recruitment 2018. Eligible candidates can apply online before 19-01-2018. Education Qualification: LLB/LLM and More. For Post wise Education Details follow the detailed advertisement. Age Limit: Age not exceeding 33 Years for Open category & 35 years for reserved category as on 31-12-2017. Interested & Eligible candidates can send their application along with all the necessary documents and testimonials to Bhagini Nivedita Sahakari Bank Ltd. Pune, ‘Nivedita Bhavan’, CTS no. 34/7, Final Plot no.35/7B, Prabhat Road, Lane no 8, Erandawna, Pune – 411004. Starting Date, Last Date to Apply online at Bhagini Nivedita Sahakari Bank Limited which candidates should be remember as follows. Start Date to Apply online: 09-01-2018. Last Date to Apply online: 19-01-2018.